Rex London, the new face of Rex International, is the home of beautifully designed contemporary, retro and vintage inspired homeware, toys and gifts. Our comprehensive collection has something for everyone – all at prices customers love. 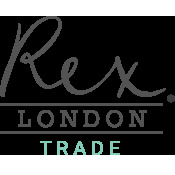 Rex London began in 1981 as a simple market stall in London’s Portobello market, selling jumpers, jeans and handmade candles. Evolving into a wholesaler throughout the 1990s, in 2003 we began to create our own products and designs. Since then, we’ve been building our reputation as a frontrunner in British design-led giftware. Our unique and fantastic value product offering can now be seen all over the world from small independent shops, to galleries, museums and large department stores. Each one of our stylish and trend-led products are designed or chosen by our talented London based designers and buyers, who work tirelessly to introduce hundreds of new lines each year. The entire range is available to view on this website, and you can also visit our stand at one of several trade shows. Please see our trade fair guide for details on the upcoming shows. Alternatively, you can come along to the showroom at our warehouse in Acton, London.